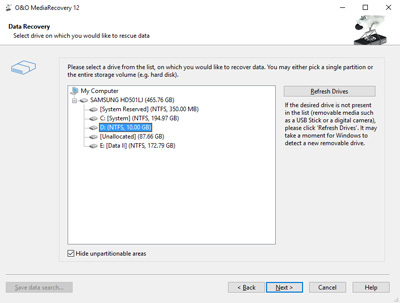 O&O MediaRecovery is special tool to recover deleted photos, songs, or videos. Full price O&O MediaRecovery per serial license key is $49.95. And a good news, the license key for O&O MediaRecovery 11 if available for free. It not the latest version because the version 12 has available on the O&O store. O&O MediaRecovery is offer easy restore solution for videos, audios, or photos. So, you don’t lose memories stored in the media files. The software support about 80 types media file formats. And also support many media storage. O&O MediaRecovery can recover lost files caused deleted, virus attack, program crash, and other accident that cause your file lost. Save $49.95 on this offer because it normal price per lifetime license key. Download O&O MediaRecovery Pro version 11 for free on this giveaway. Giveaway link O&O MediaRecovery 11: Click here to visit! The language of the giveaway page is German. Buy the get the full version O&O MediaRecovery is easy. If you are interested, download it before its too late. Visit or click the O&O MediaRecovery giveaway page. Enter your valid email address and submit the form. Click the confirmation email in your inbox. If doesn’t not found, check your spam/junk folder. Check your email inbox/spam/junk to download the installer and copy license key. Unfortunately, the installer on the email is German version. You can download O&O MediaRecovery 11 Pro English version from this link. Important note, the version on this giveawsy is not the latest. If you need full support & free update, and want better features or functions, buy O&O MediaRecovery 12.